Our snowshoes are made here in Maine and used daily by the Maine Guides of Pine Grove Lodge, foresters in the North Maine Woods, Game Wardens, and many others. We take pride in the quality and craftsmanship of our snowshoes.We lace our white ash snowshoes standard with High Performance Polyester Double Braided rope in a variety of colors, or traditional Rawhide by special order. Rope:The rope(shown above) is absolutely the strongest available, UV and abrasion resistant, unaffected by the cold, doesn't stretch or sag, and it comes in a variety of colors! There is no maintenance required. A guide at Pine Grove Lodge has 500 miles on his snowshoes with minimal wear! 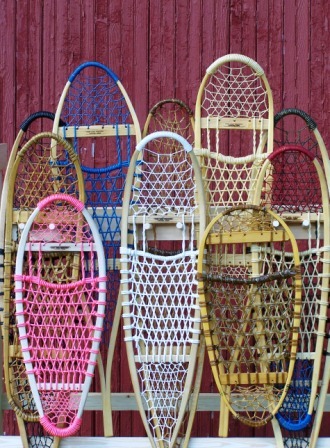 Rope is also a popular choice because of being a synthetic material, no animal products are used to make the snowshoes. Tail or no tail? : A long tail is great for open fields and trails where you will want good tracking and help with moving straighter. It is also good because it has less resistance than a rounded back snowshoe. A long tail is typically on a long shoe, so it helps with adding more flotation. You must be more careful with a long snowshoe that you don't "bridge" something and break the wooden frame. A snowshoe with a rounded back is more often better for woods and thick brush, they also back up and turn easier. They also can give good flotation, may be narrower and easier to walk normally in; these are popular styles. For people who trek in all kinds of terrain and can only have one kind of snowshoe, we offer two great shoes that have the best of both, the Sportsman and the Modified Bearpaw, they have plenty of flotation but short, stubby tails that do the job but don't get caught up in trees and brush. We are sure you will be happy with your purchase of the Maine Guide Snowshoe! Buying a pair of snowshoes is a lot like buying a car. Some people will choose one because it looks "cool" regardless of how well it runs. Others will buy one because they need it for a specific reason. A logger heading in and out of the woods all day needs a different vehicle than a suburban mother who shuttles her kids to soccer games and swim lessons. Even for the person who knows what type of vehicle they need there are more personal decisions. Make, color, engine size, and accessories are a few of the things that come to mind. Where we are in Northern Maine if you do much outdoors in the winter, owning a pair of good snowshoes is not an option—it is essential. They are a necessity for hunters, snowmobilers, and adventurers of all types. If your snowmobile breaks down and you are five miles back in the woods with bad weather conditions, you may not make it out alive without a pair. Mother Nature hasn't changed much over the years. She is as brutal now as she ever was and can still kill you in the blink of an eye. When we bought the lodge years ago part of the business was a snowshoe company. Back then most of the business was from locals.  Today, we are best known for providing high-quality snowshoes for people who absolutely depend on them like loggers, sappers, foresters, and wardens. When I talk about snowshoes it is also based on my own personal experience as a hunter and guide. Not all snowshoes are made equal. Just like a Fiat is a useless car to have on the logging roads in the North Country in February, so aren't a lot of the commercial made snowshoes on the market. To understand this takes a basic understanding of how snowshoes go together. With every snowshoe you have three basic areas to look at; the frame, the way they are tied, and the harness. Different frames are made for different uses and different situations. Personally, I have three different sets of snowshoes I use throughout the season (I am outside in a much more diverse set of circumstance than most people). As an example in the most basic sense, one of them is designed to handle large amounts of fluffy snow, and another is designed for wet, heavy snow. On dry snow I need a big set of shoes to allow me to float better on the top—this is done with a bigger surface area. On wet snow I don't need as large of a set but I need one with bigger holes which will allow the snow to fall through the shoe so I am not always picking up that weight with every step. Other considerations include what I will be doing that day. Certain shoe types perform better in the woods and others are better on trails. Some allow a hunter to take a step backwards to look for a rabbit while others are better suited for climbing. Whether the shoe has an upturn or tail are some of the factors to consider, as is the size of the person using them. All of the frames we use are made out of ash. After trying and studying every conceivable frame over the last 25 years I still believe this is the best. It holds up far better than anything else I have seen. Aluminum frames may be light, but they have other shortcomings as a shoe, and certain designs are prone to break. A few years ago I had a rabbit hunting client stop and buy a pair of aluminum snowshoes on his way up to the lodge. Now, we have plenty of snowshoes for our clients but he wanted his "own" pair and was under the impression that the new, aluminum snowshoes were better than what we offered. It was a bitter cold day and the temperature hovered around 20 below. Within 5 minutes he had broken his snowshoes—the cold and other factors had caused his decking to snap before he even had taken the price sticker off. The next thing to look at with snowshoes is how they are tied. This is the biggest disadvantage of many modern-aluminum snowshoes. The shortcoming is that while the shoes are lighter, they aren't big enough and don't have large enough space to allow snow to fall back through the shoe. What is the point of saving a few ounces in weight if you are picking up extra pounds of snow-weight with every step? We tie our snowshoes with a couple of different material choices. One is the traditional rawhide. Believe it or not this is the most expensive due to the price of rawhide. It works well and has the "traditional" look but needs a little more maintenance than other options. You have to varnish them regularly. Also, if you leave rawhide shoes in a barn or cabin it isn't unusual to come back and find that mice have chewed on them. Neoprene is another choice. For a while during the oil shortages this was an expensive choice as neoprene is an oil-based product. Lately, the price has been coming down again so we are tying more shoes with it. It is rugged and water resistant. Other than the cost, it is a great material. The third choice we have is rope. We began tying with rope a few years ago to provide a little more affordable alternative that wouldn't compromise quality. We use a very specific double braided polyester rope which is no-stretch, is anti-scuff, and UV resistant. It is tough, relatively inexpensive, and holds up very well. It also comes in a variety of colors. Not all rope is created equal though. Some tiers will use a very cheap rope which looks good on the shoe but will not hold up. While good rope is rugged enough for daily use ice and snow will cut cheap rope in a matter of minutes. The last consideration on a shoe is the harness. The harness, or binding, we have is made of heavy duty UVMH Polyethylene, with good, strong straps. They have big buckles which allow for an easy on/off and don't wiggle. They are the same shape and design as our formerly made white ash harness. It holds your boot tightly and can adjust in the width. Many harnesses are too small. The parts freeze and can't be worked with gloves or cold fingers. Some loosen up quickly and others you can't get your foot out of. One of the biggest considerations is to buy your shoes from a reputable source you know. On the internet, there are a number of people who sell shoes, but not all of them back their product. Make sure you know what you are getting and in all likelihood if the price seems too good to be true there is a reason.